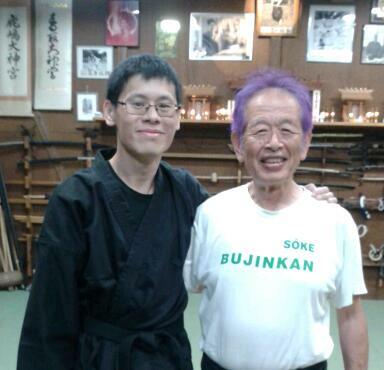 I attended two of Hatsumi Soke’s classes during my stay in Japan. He would have a senior practitioner show a technique, whether unarmed or with weapons, and then he’d add in his take on it. His take on things seems to be more of using the fingers for very subtle control and manipulation of the opponent. By the time the opponent realizes what is going on, he has already changed the direction of his force, leaving the opponent totally confused and unable to react effectively. Sounds cool? But I couldn’t do any of it. Heck, most of the time I had no idea what on earth he was doing! 1) I had looked up to him ever since I was a teenager. This is now my chance to finally meet him, albeit at a distance. 2) He is getting on in years, and he won’t continue teaching forever. I think it is best that I grab the opportunity to see him while I still can! Hatsumi Soke would sometimes have his senior teachers call their students to demonstrate a technique. On the very first class, I was training with a couple of other guys and one of them was called up by his teacher. So he also had me go up to the centre of the training place and I had to demo my take on the technique shown. Having not trained with anyone senior for a long time, I felt myself begin to panic at the thought of making an absolute fool of myself in front of Hatsumi Soke and the senior practitioners from around the world. I was hoping that Hatsumi Soke would not notice me at all, at least, not until the moment came for me to take the sakki test for godan. But now I was in the centre of attention, all eyes on me, and it was only my second day in Japan, not enough time to get warmed up. Oh boy! Another incident: a few years ago, my sensei told me that during one of the classes he attended, he looked lost when Hatsumi Soke showed a finger-control technique. Hatsumi Soke then went over to demonstrate it on him. And then he was videoed thrashing about in pain, recorded for all posterity! On the second class of Hatsumi Soke that I attended, Hatsumi had just demonstrated a finger-control technique, and I was asking the recipient how was it done. And he came over, just as he did for my sensei a few years back, and did the same technique on me. There I was, thrashing about in pain, just like my sensei. Makes me wonder if any of my students will ever go Japan and experience the same thing?